The Audi S4 is a luxury sports sedan built German brand Audi. To date, four generations of successive Audi S4, respectively named S4 B5 (1997-2002), S4 B6 (2002-2005), B7 S4 (2005-2008) and B8 S4 (since 2009). S4 C4 (1991-1994), it is the sporty version of the latest Audi 100. The Audi S4 is the sports version of the Audi A4. It has since 2003 4.2 V8 engine VAG group and all-wheel drive Quattro. Previously (1999-2001) she was driven by a 2.7 L V6 unit supported by two turbochargers (one on each cylinder). So with its 4.2-liter displacement and an output of 344hp, V8 like all big engines characterized by its substantial torque of 41.8kgm. S4 despite its 1750kg showed the performance of the first order with a leading 0 Ã 100km/h in 5.6 seconds and completed a 1000 m start/stop done in 25.3 seconds. The Audi S4 B7 is very recent since it was redesignated the last time in 2005. Although Audi classifies it as a new car, the differences between it and the outgoing B6 S4 are primarily cosmetic. - Engine placed behind the front axle, for a better “feel” the road. - New integral transmission typed 40-60% on the back normally. Course always variable. - New box Sequential speed S Tronic automated and 7 more reactive..
- Differential Quattro Sport for winding turn inward. - Possibility of controlled suspension and dynamic steering via the optional Audi Drive Select. Only difference convertible reached a weight of 1895kg (empty) because of chassis reinforcements to improve stiffness compared to sedans and station wagons. 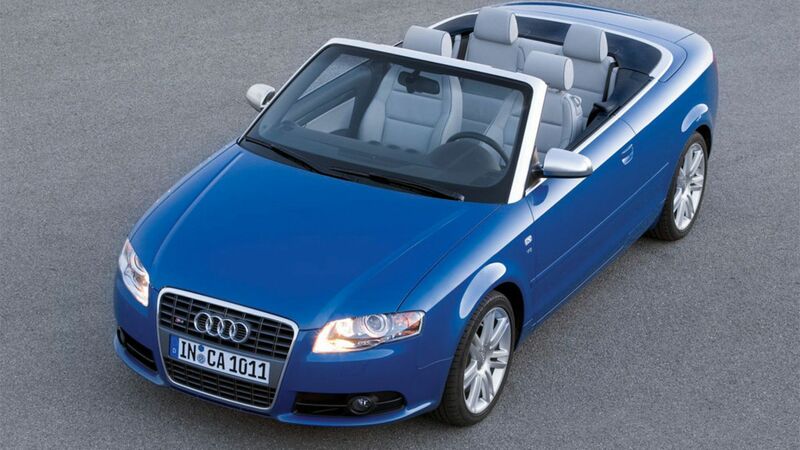 All B6 and B7 S4 Cabriolet are manufactured in the factory Quattro GMBH which normally produces the RS models of the Audi brand.